Hats off to Nancy Bertrand for the incredible article on Solon Osmond Richardson, creator of the Dr. Richardson Bitters which is known to so many bottle collectors. Dr. Richarson’s enterprise was quite successful; many bottles of his product remain today. The product was first produced by Solon’s father, Nathan as early as 1808, Bertrand tells us. Solon took over the business in 1837 after his father passed away. Like so many medicines of its time, it contained mostly alcohol. 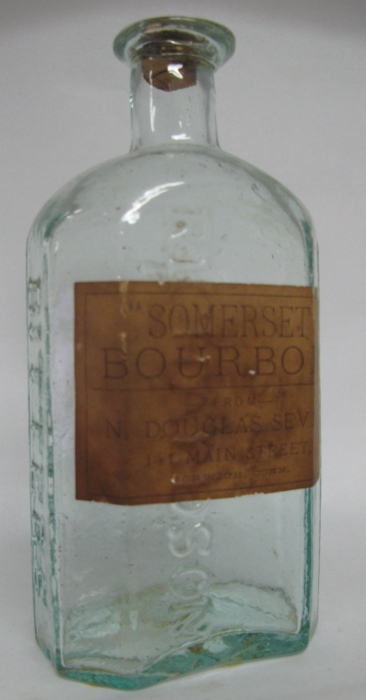 Here is a photo of a Dr. Richardson bottle which was re-purposed in the 19th century as a vessel for “Somerset Bourbon” which was sold by N. Douglas Sevin in Norwich, Connecticut.